Wales went behind – but nevertheless produced a brilliant all-round team display to eliminate Belgium. Chris Coleman made one change to his side, reintroducing Hal Robson-Kanu, who was deemed more likely to stretch the Belgian defence than Sam Vokes, a more traditional centre-forward. In a game where Wales expected to play on the break, that key selection decision made sense. Marc Wilmots was forced to completely change the left of his defence, with Thomas Vermaelen suspended and Jan Vertonghen injured. Jordan Lukaku played at left-back, with Jason Denayer at centre-back. While Wales would eventually dominate this game, they endured an extremely difficult first 15 minutes. Even before Radja Nainggolan put Belgium ahead from long-range, Wales were forced to repel three early shots in quick succession with Wayne Hennessey saves or last-ditch blocks. That move had come after Belgium forced a turnover in midfield and launched a lightning-quick break which featured all four of their attackers, a rare piece of cohesive Belgian play in this tournament. In the early stages, when Belgium were pressing high up, Wales couldn’t get the structure of their team right. The wing-backs were very advanced from an early stage, while Aaron Ramsey, playing a shuttling role, positioned himself in the number 10 position. 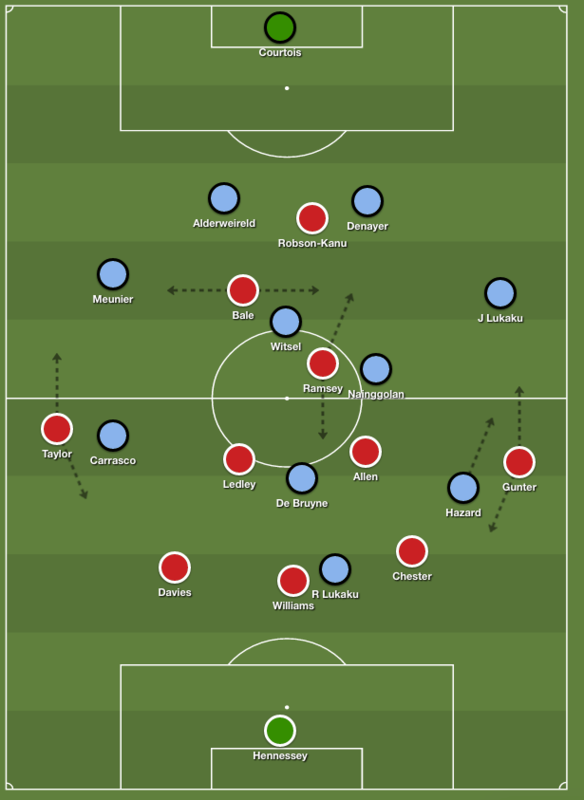 Wales struggled to play around Belgium’s pressure, and probably should have started more cautiously, the wing-backs deeper and Ramsey coming shorter, to allow them to get a foothold on the game. The aggressive positioning of Ramsey, Chris Gunter and Neil Taylor would eventually pay dividends, but Wales struggled to work the ball forward early on, and were forced to halt a succession of Belgian counter-attacks with cynical fouls. Interestingly, the only other blatant example of tactical fouling during this competition was also against Belgium, from Italy on the opening matchday. Wilmots’ side were the most dangerous counter-attackers at this competition. For the Belgian goal itself, Ramsey was guilty of moving too deep to track Axel Witsel when there was no need, opening up space for Nainggolan. The midfielder was a considerable distance out, but it was unusual to see a player in that zone with so much freedom. Ramsey was asked to concentrate so much upon playing energetically, almost as a defensive midfielder and an advanced midfielder simultaneously, that he seemingly ‘overran’ in this instance. From there, however, Wales were superb. And although, unusually, they scored three goals that were neither scored nor assisted by Gareth Bale, the Real Madrid man was crucial in Wales launching a comeback. 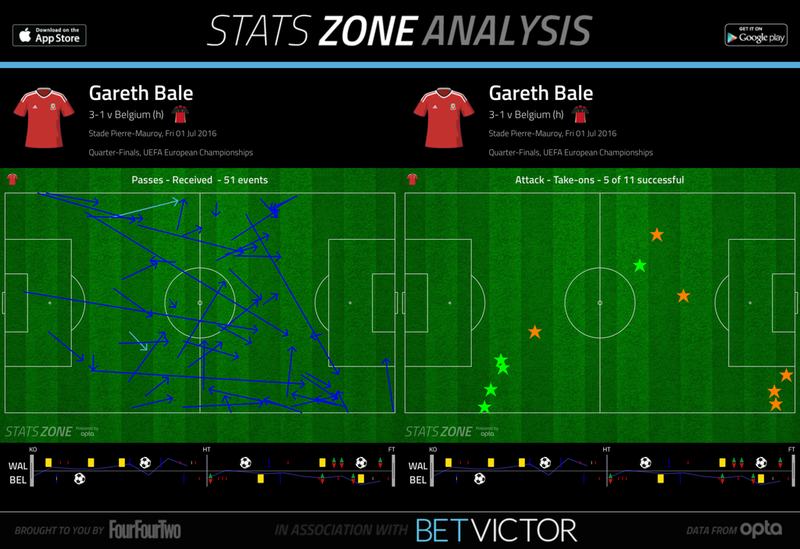 When Wales were pinned back during the opening period, Bale drifted laterally to receive forward passes on the break, and launched quick, solo counter-attacks. At this stage, he was Wales’ only attacking threat, and his freedom to move across the pitch into different positions was absolutely crucial in turning the tables and forcing Belgium to retreat. When right-back Thomas Meunier went forward, Bale drifted left into his zone. When left-back Jordan Lukaku went forward, Bale drifted right into his zone. With Witsel also concerned by Bale’s movement behind him, three Belgian players were terrified by his threat, and while Bale wasn’t directly responsible for the goals, he was crucial in allowing others to find space. His dribbles in the final third were rarely successful, but he continually breezed past opponents inside his own half, launching counters. Wales gradually built pressure, and got back into the game from Ashley Williams’ simple header from a right-wing corner – Belgium, bizarrely, consistently ignored Williams when defending set-plays. Then there was the role of Ramsey. With Bale in the number ten role, Wales generally had 4 v 3 in the midfield zone, and were able to play good forward passes into both Bale and Ramsey between the lines. The Arsenal midfielder was the greatest beneficiary of this, with no Belgium player having direct responsibility for containing him. Sometimes he was watched by Nainggolan, but this simply allowed Joe Allen and Joe Ledley time on the ball, with Kevin De Bruyne unable to shut down both. When they advanced, they were able to find space between the lines, but usually they held their position and it was simply Ramsey running into the inside-right channel to find space. Ramsey was continually dangerous and created two excellent chances from that channel – an opportunity for left-wing-back Taylor when Wales were 1-0 down, and the assist for Hal Robson-Kanu’s brilliant turn-and-finish to make it 2-1. He also created three set-piece chances, including for Williams’ equaliser. Wales were causing such problems in the centre that Wilmots decided to beef up his midfield at half-time by bringing on Marouane Fellaini in place of Ferreira-Carrasco, moving De Bruyne right and pushing Nainggolan forward into the most advanced midfield role. Robson-Kanu, incidentally, was an inspired choice by Coleman, who had started Vokes upfront for the previous two games. Vokes is better at holding up the ball, while Robson-Kanu is a converted winger capable of stretching defences. He did that excellently when Wales were trying to feel their way into the game, but then also proved a decent target for crosses, which was a bonus. Once he’d run himself into the ground, Robson-Kanu was replaced by Vokes who provided the towering header to extend Wales’ advantage, courtesy of Gunter’s fine right-wing cross. It worked out perfectly for Wales. The thing that caused Belgium most problems, though, was the positioning of the Wales wing-backs. Gunter was involved much more in building up play down the right, with Wales perhaps trying to target the weakened left side of the Belgian defence, while Taylor was usually stretching the play on the left. Belgium didn’t know how to cope with them: their full-backs were terrified to advance and leave their wide zones free for Bale and Ramsey to drift into, and also focused on tucking inside to support their makeshift centre-back pairing. Eden Hazard and Yannick Ferreira-Carrasco sometimes tracked the Welsh wing-backs, but if they followed the whole way, Belgium would end up playing a back six, because Gunter and Taylor essentially became wide forwards in possession. It was surprising that Hazard, in particular, didn’t position himself better to drive forward on the counter-attack. 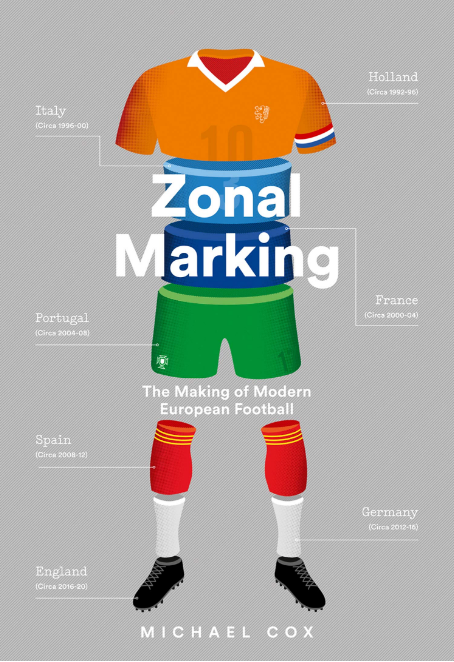 Indeed, Belgium’s main problem is the positioning and structure of their attacking players. Aside from that one combination early in the game, there were little signs of cohesion, and their gameplan still seems based heavily around individual brilliance. Wilmots supposedly never works upon the movement of his attackers, and while this most obviously causes problems in possession, Belgium’s poor structure often means opponents can counter-attack into huge gaps at turnovers, too, and Wales were always a threat here. Although Belgium have been criticised for lacking a “Plan B”, they created problems when Meunier attacked down the right in the second half, and from one of his crosses, Lukaku should have headed home. The half-time introduction of Fellaini also provided an aerial target, even if he had been brought on for different reasons, and he should have scored from another right-wing cross, this time from Toby Alderweireld. It’s easy to pinpoint the dying moments, when a team fails to chase down a game successfully, as the reason they lost. Breaking down a packed defence is difficult. Belgium didn’t lose the game in the final 20 minutes, they lost because they weren’t clinical enough in the early stages, then marked poorly at set-pieces and struggled to cope with the numerical disadvantage in midfield, and the positioning of Wales’ wing-backs. Wales’ organisation was far superior throughout this game. It felt like they had more players on the pitch – partly the result of the dual roles played by Gunter, Ramsey and Taylor – defensive players without the ball, attacking players with the ball. 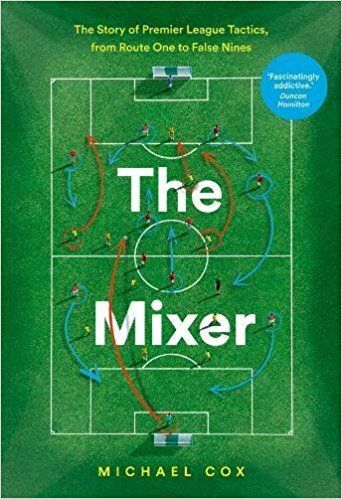 That might sound simple, but it contrasted hugely with a compartmentalised Belgium team lacking cohesion between attackers – never mind cohesion between the different lines in their system. Although this was a day for the unheralded players, the roles of Bale and Ramsey shouldn’t be underestimated. Bale’s threat terrified Belgium all game, forcing them back and creating space for others, while Ramsey supplemented his admirable energy levels with great technical quality in the final third. Wales were vulnerable to counter-attacks in the opening period, and could have slowed the tempo better in the closing stages, but for the majority of the game they completely outplayed Belgium. As an Italian it has been a pleasure to see how Wales have been so tactically astute throughout the tournament. Coleman has been fantastic and has used his star players brilliantly. It isn’t a pure diamond 4 in midfield but in essence thats how it operates. I see Bale’s role a bit like the “central” winger that Alexis Sanchez was for Udinese in their great season of 2010-11. From this aspect the belgian full backs understandably protected their zones. I do feel in Belgium’s game against Italy the full backs could have been far more aggressive as Italy don’t have a Bale to attack the flanks (conte doesn’t like this type of attacking movement in any case). In any case, in this situation you either play aggressively 1 v 1 like Bayern did to Conte in 2013 or you do what Germany did last night. Nullify by playing a back three. Although they were more aggressive without the ball than a Serie A team matching Conte with a 3-5-2. Belgium couldn’t play a 3-5-2 though. They lacked all of their fine centre-backs to create a competent 3-man defense and they have long struggled with producing fine full-backs, let alone wing-backs. The formation would also kill off their biggest asset which is a large array of very talented wingers. Even if you dropped one striker and create a 2-man attacking midfield behind a lone striker, who would play there? De Bruyne could cope, but Hazard, Carrasco or Mertens would be out of position. And most importantly, 3-5-2 would require a very large amount of workload for each player. No wonder why Italy, Wales and Germany have played it, they are by far the most organized teams in the entire tournament and their players work hard as a team. Belgium lacks a team spirit and willingness to endure high workloads since (as Michael said) Wilmots prefers to leave his stars have more freedom. And that is why Belgium are overrated. Anyway Germany’s wing backs werent amazing but positionally it worked. If they want to give their stars all that freedom then they need to have at least a solid base behind them. They’re so uncompact its ridiculous. Amazing counter attackers and they capitalised on Ireland and Hungary’s tactical niaivety. But even when they were up against hungary they conceded so many chances becuase they are disorganised without the ball. What’s stopping hazard playing a more central role like Bale? When I watch these tournaments i begin to realise how tactically advanced italy is to the rest of the world. Anyway Conte at Chelsea is going to be so interesting. Good luck to Hazard if he doesnt want to play as a wing back for Conte. Yes, Belgium is grossly overrated, but not being able to play 3-5-2 isn’t one of the reasons for that. Yes, they are disorganized and tactically inflexible, that’s the issue. Hazard playing centrally isn’t bad, it’s just not playing to his strengths. That’s why Ronaldo isn’t playing as a striker for Portugal, he doesn’t like the position (which Michael also mentioned accurately in another article) which makes the team lesser. It’s an unwritten rule that you should play your finest players in their natural position so they take command of the game. Portugal’s haphazard structure makes Ronaldo semi-functional and it really shows this tournament. Hazard centrally would be in the same mould, imo. Does it really take a 3-5-2 to beat a 3-5-2? Heyncke’s 4-2-3-1 Bayern convincingly beat Conte’s 3-5-2 Juve in 2013 , and it was when Juve had Vidal-Pirlo-Marchisio, much more talented than this Italian squad. How was it done back then? It’s more than just formation vs formation. They’re just bands of numbers on paper. It depends on what the manager wants from his shape and their strategy. Which players does he want to have the most space. Which players are his weakest (or the opponents weakest). You can use the 3-5-2 as a defensive counter-attacking side, or as a way of dominating possession. 4-2-3-1 can theoretically expose a side playing 3-5-2 to two weaknesses: 1) one CB is obliterated as he is neither marking anyone nor playing spare-man, and 3 CBs against 1 CF means the team playing 3-5-2 have a disadvantage elsewhere on the pitch, and 2) obviously being outnumbered on the wings. That’s what Heynckes’ Bayern did (Kroos-Schweini-Muller playing wide passes to Robbery, and Alaba and Lahm thrusting forward like crazy).